Every year Mrs. Kajikawa puts on a Mother's Day Tea hosted by the Kindergartners in her class. I was thrilled to participate back in 2007 when Nathan was a Kinder, and even more excited this year. None of the other seven kindergarten classes do anything like this. It takes a ton of work. The children learn good manners, and seat their moms as they enter, serve her tea and cookies, present her with gifts and cards, and then perform six songs and a couple of poems. 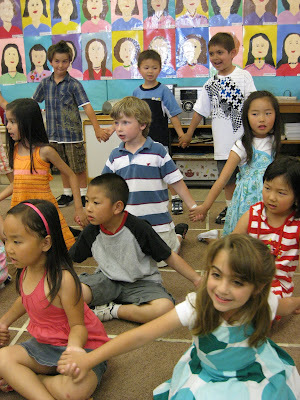 My heart was fluttery at how earnestly the children attempted to be on their best behavior and sing their hearts out. They also do a couple of special projects. 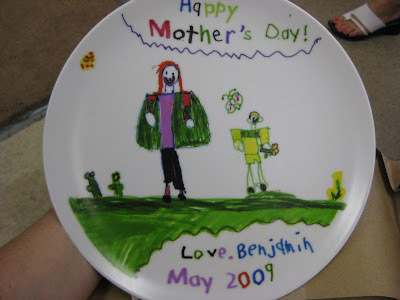 First, the kids do some special art which is sent out and put on a plate. 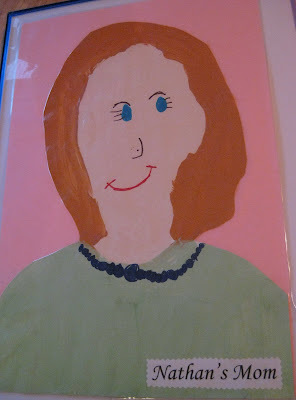 The second is a portrait of Mom, painted by the student. The kids get to mix the paint to the appropriate skin color, hair color, and choose a color for Mom's shirt and any embellishment, like a necklace. I've had Nathan's plate hanging in my kitchen the last two years, and we framed his portrait of me which hangs in our hallway. Both years the boys were very particular about mixing the exact right shade of rusty orange hair, making Mrs. K continue adding orange or yellow until it matched. I find it funny because between Nathan's kindergarten year and Ben's, I've changed my hair color three times, coming back to the current rusty shade I sported in 2007. It was a wonderful event which all the moms enjoyed! The kids singing. Ben is in the blue and white striped polo shirt. You can see all the portraits on the wall behind the kids. Here is Ben's portrait of me. He chose a green shirt for me since that is my favorite color. 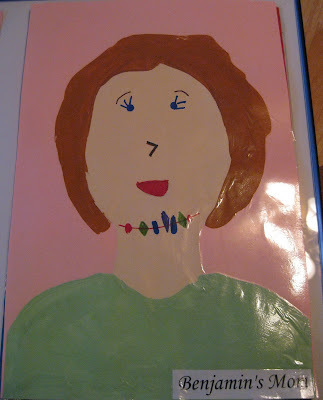 And he created a jeweled necklace that I seem to like wearing around my chin. Here is Nathan's portrait of me that hangs in our hallway. He also chose a green shirt. They know me and my love of all things green pretty well! 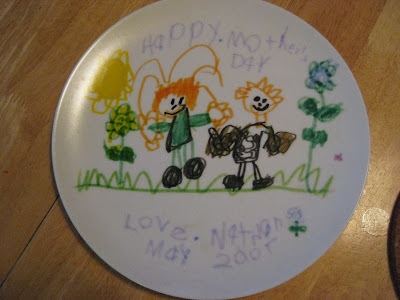 Here is the plate that Benjamin made for me. They had to draw on a special type of paper which was then mailed out to a company where it's transferred onto the plates. I was a little shocked when I saw this, thinking that Ben thought I was really, um... wide. But no, Benjamin explained, the green expanse behind me is simply my cape. It's what all the Super Moms are wearing this season. Here is Nathan's plate, a little faded after two years. His handwriting has not really improved during this time. And in Kindergarten he absolutely hated to draw or color. He complained heartily whenever he had to do it (which was every single day). Something changed in first grade and now that he's in second, his drawing skills are off the chart and he fills notebook after notebook with his sketches and doodles. wow, that's such a great idea! all i hear in the back of my head is the chu-ching of money that our school districts wouldn't spend on stuff like this. everything is out of pocket by the teachers. so sad.